In 2002 Georgia rolled into Auburn with tremendously high stakes on the table. Reaching for their first ever SEC East title had led them into Eastern Alabama with a 9-1, 6-1 record and high hopes. Unfortunately, things didn't go so smoothly. The offense came out flat and didn't convert a single 3rd down in the first half. And the defense had trouble controlling Ronnie Brown and Jason Campbell who helped propel Auburn to a 14-3 halftime lead. But Georgia's luck turned around a bit in the second half, most notably late in the third quarter when offensive lineman Jon Stinchcomb recovered a fumble in the endzone for his first "rushing touchdown". We'll look more closely at the offensive player of the game tomorrow morning, but today it's about the one guy that held things together while the team tried to regain their footing in a hostile environment. Sean Jones. The Dawgs' safety had 133 all purpose yards, 75 came on punt returns (the Tigers only netted 28 yards on punts), 11 on a fumble recovery and another 58 came on an interception return. His complete stat line for the day - 11 tackles, fumble recovery and 2 interceptions, 4 punt returns for 75 yards. He was the Super Glue that held things together so that the team could stay within arms reach of the War Eagles. 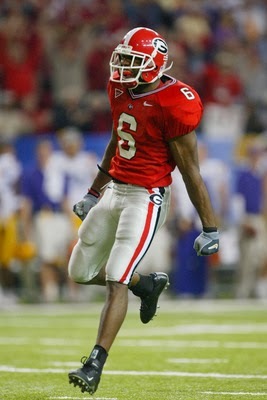 Sean Jones, damn good Dawg!